Nea Upper Village (UV) is our middle and high school learning community where the seeds planted and nourished in the Lower Village bloom and flourish. The Tree — In the Upper Village, learners utilize the "Tree" — Nea's unique community learning space. 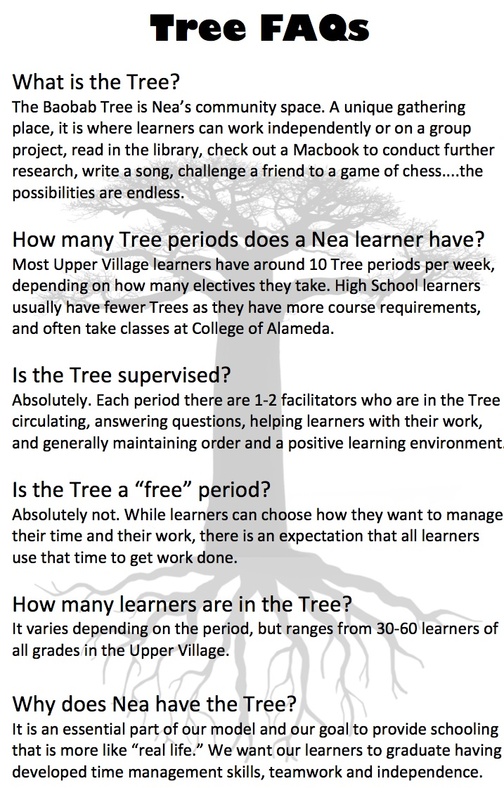 The Tree offers learners choices on how to spend their time, with the opportunity to work independently or on a group project. Tree periods help teach learners how to manage time effectively, establish and maintain work priorities, operate independently and collaboratively, and experience community. 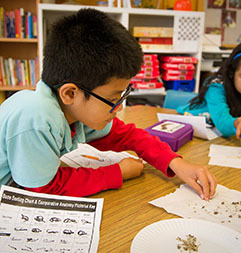 Middle School — Middle school learners are required to master California Common Core academic courses like Math, Science, Humanities and PE, required Art and Music electives, and can choose from a variety of interesting Elective courses. Middle school learners must also complete 20 hours of community service hours each year. High School — High school learners are challenged with a rigorous UC admissions-based curriculum with courses that meet or exceed A-G requirements. These courses include Math, Lab Sciences, English, History, Humanities, Economics, Government, Language (other than English), Visual or Performing Arts Electives, Current Life, PE, and various other rotating choice Electives. In addition to 80 hours of community service, high school learners must also complete one semester-long College course, an Internship, a Senior Project and a Senior Portfolio. The "Tree," as it is affectionately referred to, is Nea's Upper Village community space. A unique gathering place, it is where learners have their “CCC” meetings, assemblies, choice time, and engage in other activities and learning opportunities. It is a living community space that brings multi-age learners together to share common interests, where new friendships are formed, work on collaborative projects is done and learners grow into socially-responsible citizens.